create-context The ::create-context signal is emitted when the widget is being realized, and allows you to override how the GL context is created. render The ::render signal is emitted every time the contents of the Gtk.GLArea should be redrawn. resize The ::resize signal is emitted once when the widget is realized, and then each time the widget is changed while realized. Gtk.GLArea is a widget that allows drawing with OpenGL. Gtk.GLArea sets up its own Gdk.GLContext for the window it creates, and creates a custom GL framebuffer that the widget will do GL rendering onto. It also ensures that this framebuffer is the default GL rendering target when rendering. In order to draw, you have to connect to the Gtk.GLArea ::render signal, or subclass Gtk.GLArea and override the GtkGLAreaClass .render() virtual function. The Gtk.GLArea widget ensures that the Gdk.GLContext is associated with the widget’s drawing area, and it is kept updated when the size and position of the drawing area changes. If you need to change the options for creating the Gdk.GLContext you should use the Gtk.GLArea ::create-context signal. Creates a new Gtk.GLArea widget. Ensures that the self framebuffer object is made the current draw and read target, and that all the required buffers for the self are created and bound to the frambuffer. This function is automatically called before emitting the Gtk.GLArea ::render signal, and doesn’t normally need to be called by application code. Retrieves the Gdk.GLContext used by self . Gets the current error set on the self . Retrieves the required version of OpenGL set using Gtk.GLArea.set_required_version(). Retrieves the value set by Gtk.GLArea.set_use_es(). Ensures that the Gdk.GLContext used by self is associated with the Gtk.GLArea. Marks the currently rendered data (if any) as invalid, and queues a redraw of the widget, ensuring that the Gtk.GLArea ::render signal is emitted during the draw. This is only needed when the Gtk.GLArea.set_auto_render() has been called with a False value. The default behaviour is to emit Gtk.GLArea ::render on each draw. If auto_render is True the Gtk.GLArea ::render signal will be emitted every time the widget draws. This is the default and is useful if drawing the widget is faster. If auto_render is False the data from previous rendering is kept around and will be used for drawing the widget the next time, unless the window is resized. In order to force a rendering Gtk.GLArea.queue_render() must be called. This mode is useful when the scene changes seldomly, but takes a long time to redraw. Sets an error on the area which will be shown instead of the GL rendering. This is useful in the Gtk.GLArea ::create-context signal if GL context creation fails. If has_alpha is False there will be no alpha channel, and the buffer will fully replace anything below the widget. If has_depth_buffer is True the widget will allocate and enable a depth buffer for the target framebuffer. Otherwise there will be none. If has_stencil_buffer is True the widget will allocate and enable a stencil buffer for the target framebuffer. Otherwise there will be none. This function must be called before the area has been realized. Sets whether the self should create an OpenGL or an OpenGL ES context. You should check the capabilities of the Gdk.GLContext before drawing with either API. a newly created Gdk.GLContext; the Gtk.GLArea widget will take ownership of the returned value. The ::create-context signal is emitted when the widget is being realized, and allows you to override how the GL context is created. This is useful when you want to reuse an existing GL context, or if you want to try creating different kinds of GL options. If context creation fails then the signal handler can use Gtk.GLArea.set_error() to register a more detailed error of how the construction failed. The ::render signal is emitted every time the contents of the Gtk.GLArea should be redrawn. The context is bound to the area prior to emitting this function, and the buffers are painted to the window once the emission terminates. The ::resize signal is emitted once when the widget is realized, and then each time the widget is changed while realized. This is useful in order to keep GL state up to date with the widget size, like for instance camera properties which may depend on the width/height ratio. The GL context for the area is guaranteed to be current when this signal is emitted. The default handler sets up the GL viewport. If set to True the Gtk.GLArea ::render signal will be emitted every time the widget draws. This is the default and is useful if drawing the widget is faster. If set to False the data from previous rendering is kept around and will be used for drawing the widget the next time, unless the window is resized. In order to force a rendering Gtk.GLArea.queue_render() must be called. This mode is useful when the scene changes seldomly, but takes a long time to redraw. The Gdk.GLContext used by the Gtk.GLArea widget. 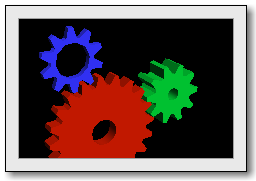 The Gtk.GLArea widget is responsible for creating the Gdk.GLContext instance. If you need to render with other kinds of buffers (stencil, depth, etc), use render buffers. If set to False there will be no alpha channel, and the buffer will fully replace anything below the widget. If set to True the widget will try to create a Gdk.GLContext using OpenGL ES instead of OpenGL.